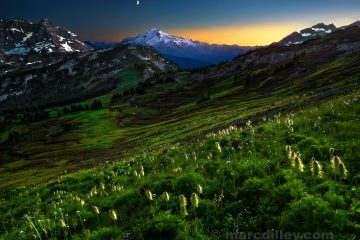 McClellan Peak sits in one of the most beautiful areas in all of the Washington Cascades, or for that fact, just about anywhere. The Enchantment Lake basin is home to McClellan Peak. This area is part of the Stuart Range and is legendary among those who have become “Enchantment” addicts. McClellan is generally overlooked by those who set their sights upon Prusik Peak or nearby Dragontail but there are many routes and interesting rock towers that can challenge just about any taste in mountaineering. Turn onto Icicle road from US 2 toward Leavenworth. This junction is signed and a 76 gas station is at this intersection. The second way to get to this trailhead from Seattle or the Everett area is to take US 2 over Stevens Pass to Leavenworth. When you come out of the canyon, turn right on the Icicle Creek Road.